In the hot, humid South push mowers were torture in the summer. My thrifty father never bought a new one. We had two of the old heavy ones, but they really cut the grass and made the lawn look manicured. I remember seeing a gardener on a riding lawn mower and thinking he must surely be wealthy. This was how we mowed our lawn for many, many years. I don't think my dad bought a power mower until long after we'd left home. I found out later that some of the neighborhood kids used to laugh when they saw us pushing this thing. For me, the biggest drawback to these is they come to a sudden dead stop if you hit a twig. You have to stop and clear it. But certainly quiet and environmentally-friendly! I'd go back to them if I knew I could get a quality-made reel mower. The one we had back in the 1930's and 40's was heavy as hell to push, but later models were much lighter when they replaced the original iron and steel and dense wood with aluminum and plastic parts and blades. I'll never forget tyhe sound of the whirling blades these babies made. 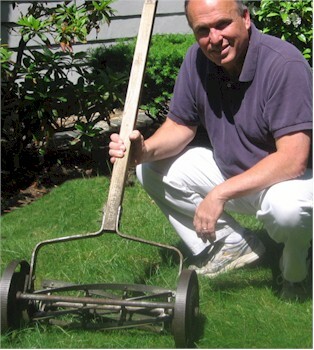 As I recall, the mower itself wasn't so heavy or difficult to manage (provided the spinning blade mechanism was properly lubricated). But when the cuttings catcher was added in the back, that was another story. I can recall many a Saturday or Sunday pushing one of these around our Long Island lawn. We never did get a power mower, although all the neighbors had 'em. They were the first of the new noisy crop of labor-saving appliances to hit our formerly-quiet neighborhood, to be followed quickly by leaf blowers, weed whackers, and snow blowers. Sleeping in on weekend mornings became nearly impossible.